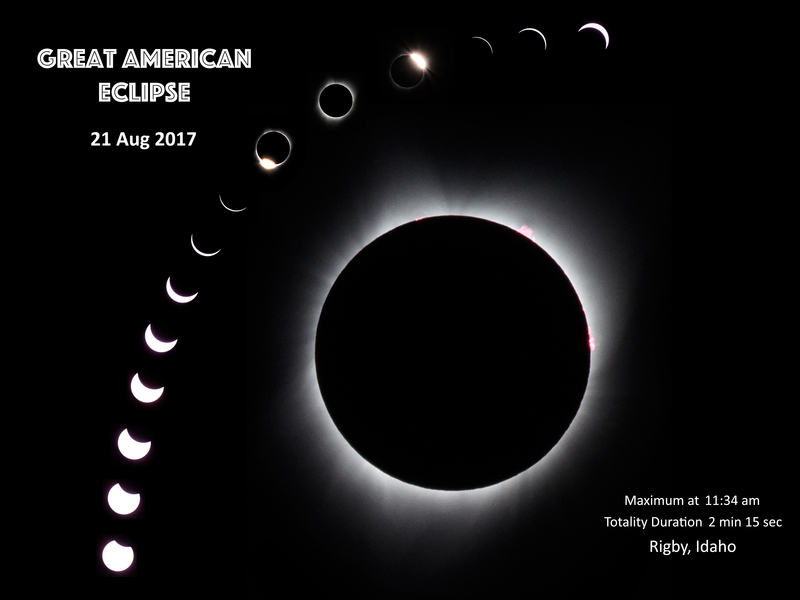 This composite picture shows the different stages of the Great American Eclipse—from the beginning of partial eclipse (lower left) to totality (near top center) to the ending partial phases (upper right). The large inset photo shows the totally eclipsed sun at maximum. The red jets seen at the 1, 3 and 11 o’clock positions are called prominences—arches of hydrogen gas that are ejected along magnetic loops above the solar surface. This red color is a characteristic feature of hydrogen gas. Other gases emit other colors—sodium, for instance, glows yellowish like in sodium street lights. This eclipse displayed a pearly white corona that extended in long streamers. Astronomers were not expecting to see streamers during this eclipse, since the sun is currently near sunspot minimum. Normally when there are few sunspots, the corona takes on a less interesting shape that’s uniform and void of streamers. But just a day or two before this eclipse, the sun broke out with some strong magnetic solar activity, which gave the corona this more picturesque appearance. In the composite picture, on either side of totality, are shots of the Diamond Ring effect. Occurring just before and after totality, the Diamond Ring is caused by the rugged lunar surface with its mountains, craters and valleys. Just before the moon’s leading edge fully blocks the sun, one last valley along its limb will allow sunlight through, causing the bright flare known as the Diamond Ring. This also happens at the end of totality, when the moon’s trailing edge slips off and first reveals the sun again—signaling the end of totality. Thus, the Diamond Ring's flare can show up on opposite sides of the moon’s limb—moments before and after totality. A close look of the second Diamond Ring in the composite photo shows a thin red glow along the moon's limb bracketing the Diamond Ring’s flare. This is called the chromosphere, which is a very thin atmosphere of red glowing hydrogen. The reddish chromosphere lies between the faint white outermost atmosphere called the corona (normally visible only during an eclipse) and the bright lower atmosphere called the photosphere (the familiar yellow disk visible each cloudless day).